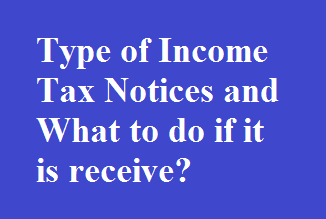 Home / Income Tax / Type of Income Tax Notices and What to do if receive? 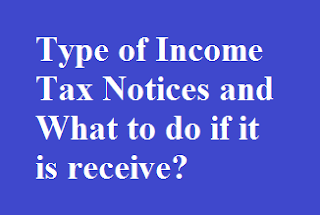 Type of Income Tax Notices and What to do if receive? Most of the income tax notices that you may get are routine and there’s no need to worry if you have not hidden your income and filed your returns It is that time of the year when you may have received a notice from the income tax department. However, unless you have hidden some income from the department or not filed your taxes, you need not worry. Most of these notices are routine and are regarding mistakes you may have made while filing income tax returns (ITRs), especially for assessment years (AY) 2016-17 and 2017-18, or clarifications related to your ITR. The last date for filing returns for AY17 and AY18 was 31 March 2018. According to the income tax department, there is substantial increase in the numbers of registered users on its e-filing portal, which has translated into more returns filed. As on 30 April 2018, there were about 73.9 million registered users on the e-filing portal and about 67.5 million people e-filed their returns during financial year (FY) 2017-18, compared to about 52.9 million returns e-filed during FY17, an increase of about 27%.Given the increase in return filers, some of them new, the possibility of mistakes are higher, and these can lead to notices. Here are five common tax notices that an income tax payee can receive, whether she filed her returns or not. However, sometimes the department can send, “routine notices in the nature of providing information on arithmetical errors, mismatch of income declared in return and as appearing in Form 26AS”, said Poorva Prakash, senior director, Deloitte India. For instance, you may need to respond, if after processing your return, the department finds a mismatch in the tax paid or refund claimed by you vis-a-vis the tax deducted at source (TDS). Or even if you mentioned your permanent account number (PAN) or other details incorrectly. Scrutiny notices: You may get notices for verification, regular assessment or reassessment or for limited scrutiny. “In case the department needs any information or clarification in relation to making assessment of income tax return filed by the assessee, notices under Sections 142(1) and 143(2) can be issued asking for information or details in relation to tax return,”. Show cause notices: “In cases the tax department is of a view that there is concealment of income leading to shortfall in tax deposit, show cause notice for penalty may also be received,”. Prosecution notices: The department can also send a notice under Section 143(2) if you fail to file your returns even after receiving a notice under Section 142(1), and for other offences. “Recently the department also issued prosecution notices to tax payers where returns were not filed within the prescribed timeline or there was a shortfall of tax,” . Notices on details of income/assets outside India: IT department is taking various steps to curb the use of black money and benami property. For this, the department may send a notice asking details of foreign assets. “Notice can also be issued by Intelligence Criminal Investigation Division of Income Tax Department (reference: under Section 133(6) of Income tax Act, 1961) seeking clarification or documentary evidence on various sources of income or assets located outside India,”. For each tax notice, a particular response procedure has to be followed. Once you receive such an email, access your income tax account under the head “My Account”, click on “My Pending Actions” tab or on “Worklist” and then go to “For your action” to see if any demands or arrears are pending in your name. You can reply to almost all tax notices online through the account. Some notices are also issued by the Central Processing Centre (CPC). You can respond to most of these online through your income tax account; unless personal appearance is specifically asked for. Personal appearance is typically required when the assessing officer wants to further discuss the case or verify documents in original which is not possible online. “In case of personal hearing, the individual should meet the officer to explain the case,”. Replying to income tax notices within the stipulated time is a must. “There is a general penalty of Rs. 10,000 for each default or failure, in case any assessee, who is legally bound to furnish information or to comply to a notice issued by the Income tax department, but fails to or defaults in making such compliance,” said Kumar. Additionally, there may be specific and more severe penalties, if the assessee fails to furnish certain specific documentation or information required, added Kumar. Things can get escalated to prosecution, depending on the case. Also, the penalty can be as high as 300% of tax dues and jail term can be up to seven years. In case you need additional time to respond or to provide documents asked by the department, you should request for an extension of time to reply either by approaching the respective assessing officer or through the online portal. Take the notices seriously and if you think you will be unable to reply appropriately, take the help of a chartered accountant or other experts.